What Sort Of Self-Respecting Black Man Wears Rundown Sneakers? I am a 41 year old black man. I do not care about sneakers. I never have. Clearly, something must be wrong with me. I make good money, much of which goes to my wife's internet shopping hobby feed, clothe, and educate my 3 children. Beyond that, I certainly love the occasional slurge, but I'm what most people with label as "miserly". Note, this isn't the same thing as "cheap", although sometimes my wife would beg to differ. It simply means I prefer to save and invest, as opposed to blowin' money fast. I waste money on lots (and I do mean lots) on frivolous sh*t, but one exception is footwear. Yes, I have some very nice dress shoes. But when it comes to sneakers, I just don't care. I get a few new pair a year. They usually begin as running shoes, and then at some point reach retirement and become everyday shoes. When they're totally done, I put them out to pasture and use them when I do yardwork. Most of them are New Balance. I wash and care for these shoes, so they don't look totally rundown, but they aren't by any stretch of the imagination "new". Everytime I'm out, I'll inevitably pass brothers on the street, some my age, some younger, and most of them are wearing absolutely spotless, brand new shoes. The shoes will often match whatever outfit the dude's wearing, and yeah, the overall effect will usually look pretty fresh. 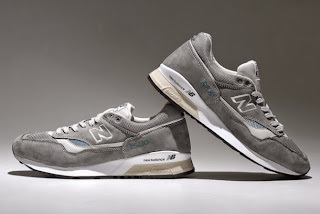 Then I'll look down at my feet and see a pair of 993s with lots of mileage on them. For a moment, I'll feel like I'm missing out on something. And then I'll realize, that try and I might, I simply cannot scrounge up two f*cks about shoes, and I'll just keep it pushin'. I don't begrudge these brothers their right to wear brand new $150 kicks. It's just not for me. And I wonder what, if anything, that means. Ya'll tell me. Question: Am I the only black man that doesn't wear brand new sneakers everyday? Does this make me a weirdo? How Will The Obama Presidency Be Remembered?!? You'll notice that in addition to not posting much at all here lately, I haven't said much about President Obama here for some time. The reasons are many, and I'll prolly elaborate once I get a bit more time to breathe. But as The Obama Era lurches into its final years, many are already beginning to write its epitath. I find that a little silly. It would be like beginning to write a movie review at the 3/4 mark, or leaving a sporting event at the end of the 3rd quarter. But hey, it's a slow news day, so how about we let mediocre documentarian Michael Moore weigh in on this topic? Let it be known that Michael Moore is not a fan of President Obama. In a new interview with The Hollywood Reporter from the Toronto International Film Festival, the Academy-Award winning director was asked about the current state of Detroit and from there, dissects what the president’s legacy will be. His prognosis? Not great. I have some (admittedly premature) thoughts of my own, but I'd rather hear yours first. Weigh in below. 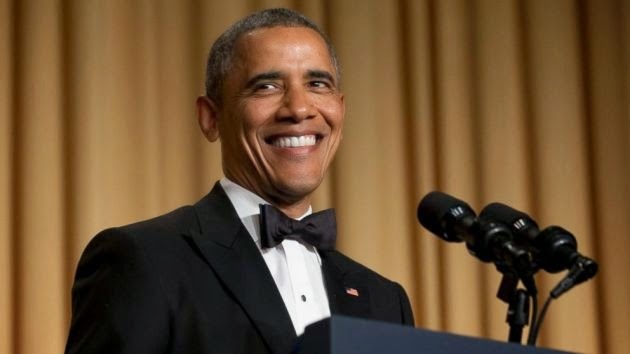 Question: How will history view the Obama presidency? How will you personally view it, based on your expectations when he was elected? 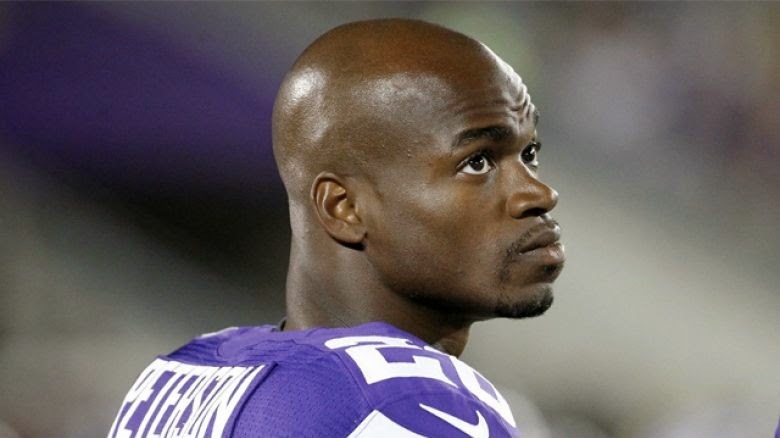 Adrian Peterson: Serial Child Abuser Or Concerned Father?!? I just spent the past few days being extorted by a Mouse, so I'm sorta playing catchup right now. In any event, last week was a less-than-great week for the world of professional sports. 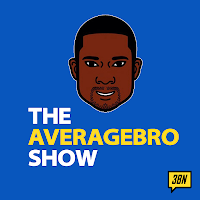 Between the Atlanta Hawks situation, the Ray Rice video, Chris Johnson's roid rage, and Roger Goodell's general nonsense, you got the impression things couldn't possibly get any worse. And then Adrian Peterson happened. Adrian Peterson, already facing felony charges in Texas for child abuse, was accused in a previous incident involving another son who was 4 years old, KHOU-TV in Houston has reported. They are allegations the Minnesota Vikings running back's lawyer says were unfounded and more than a year old. KHOU cited text messages that reportedly include a photo of the son with an apparent head wound covered by bandages. Houston TV station KHOU reported Adrian Peterson was previously accused of child abuse in a separate incident involving another son who was 4 years old. Peterson was indicted by a grand jury on charges of reckless or negligent injury to a child on Friday. The prosecution in the ongoing case was aware of the June 2013 incident, a source familiar with the case told ESPN NFL Insider Adam Schefter. Peterson, who apologized in a statement Monday for "the hurt I have brought to my child," also said he will testify in court that he did not intend to harm his son and said he is "without a doubt, not a child abuser." The Houston TV station reported that the mother of the 4-year-old -- who is different from the mother of the child he stands charged with abusing -- filed a report with Child Protective Services, but no charges were brought. Peterson attorney Rusty Hardin said in a statement that the accusation was more than a year old and that "authorities took no action." "An adult witness admittedly insists Adrian did nothing inappropriate with his son," Hardin said in the statement to media. The Vikings released a statement Monday night, saying they would "defer any further questions" from the media regarding the accusations to Hardin. "As part of the information we have gathered throughout this process, we were made aware of an allegation from 2013 in which authorities took no action against Adrian," the Vikings said in the news release. According to the report, Peterson then goes on to say he was disciplining his son for cursing at a sibling, though how specifically the child was wounded wasn't made clear. Peterson never directly answered, the report said, but later replied: "Be still n take ya whooping he would have saved the scare [scar]. He aight [all right]." When asked about the 2013 accusation, Peterson's father, Nelson, said, "I haven't seen that report. I haven't heard any allegations." Peterson has faced heavy criticism for his use of a so-called switch to discipline the other son, but the running back said in the statement released Monday that he "never imagined being in a position where the world is judging my parenting skills or calling me a child abuser because of the discipline I administered to my son." The Peterson incident has "sparked a nationwide debate on how parents should/should not discipline their children", and has also sparked a million examples of culturally unaware white media members trying to explain what a "switch" is. I grew up in the South. And growing up in the South, in the 70/80s meant that sometimes when your grandparents needed to discipline you, they sent you behind the house to "pick a switch". I'll note that my parents didn't even (to my best recollection) deploy this style of punishment, but they were well aware my grandparents did. It was simply a traditional style of discipline, passed down from generations. It was not necessarily any more painful than a belt, but it was more humiliating, and certainly seemed to get the point across. I don't think I got "the switch" more than 4-5 times as a kid. The message was effectively relayed. Many who are defending Peterson seem to echo the same sentiments: This is just what black parents in the South do/did and isn't child abuse. I think that's where I disagree. Using a switch isn't "child abuse" in and of itself. But using the switch to the point that blood is drawn and welts are visible days later is definitely child abuse. Peterson overdid it (something he acknowledged) and will/probably should face charges. He took it too far. There's a thin line between discipline and abuse, and he crossed it. It should also be noted that his childrens' mothers waited awhile to report the incidents, but well, that's another topic for another day. One subtext that's really disturbed me about this incident has been the scores of black people insisting that "getting the switch" is good, because they got it, and it "worked". I think that's shortsighted, plantation thinking at best, self-hatred at worst. I mean, come on, sure it "worked", but so might have a million and one other discipline techniques, from "being on punishment", to losing toys/TV time, to the proverbial "time out". Just because something "worked" doesn't mean it was the best way to handle the situation. I could use a hammer to kill a fly, but a flyswatter would probably work just as well and not cause as much damage to my granite countertops. I don't know how prevalent "the switch" still is as a disciplinary tool in black households. My wife and I don't use it (although we do spank our children when the need occasionally arises). I'd be interesting in your thoughts. Question: Did you parents use "the switch"? Do you still use it? Did Peterson overdo it? Should Ray Rice Be Suspended For Life?!? 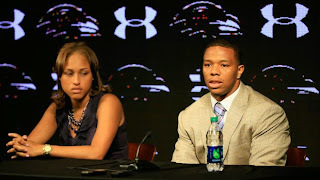 Domestic violence is no laughing matter, but the suspension the NFL handed to Baltimore Ravens running back Ray Rice after such an incident last Winter has roundly been criticized as a joke. Rice, for those unaware, cold cocked his then-fiancee in the elevator of an Atlantic City casino (what is it with black people and elevator fights?) in February. After investigating the incident, NFL Commissioner Roger Goodell gave Rice a palty two game suspension. To put this in context, Cleveland Browns receiver Josh Gordon was suspended this entire season after testing positive for a banned substance (aka: Tha Chronic). Sure, Gordon's suspension was extreme because was a repeat offender (what is it with pro athletes and weed?) but still, the message conveyed didn't look great optically. I mean, come on, NFL players have literally killed people and gotten the same suspension! But going MMA on your wife means you can be back by Week 3? Come on. In any event, Rice's suspension was the end soon, but TMZ just released additional footage of the elevator incident and many are now calling for Goodell to drop the hammer on Rice. Shocking new video shows Ravens running back Ray Rice delivering a ferocious punch to his fiancée, which knocked her out cold and landed him a two-game NFL suspension. In video obtained by TMZ, Rice can be seen lunging at his fiancée several times as he tries to intimidate her outside the elevator at the Revel casino in Atlantic City. She angrily gives him a backhand slap before they make their way towards the open doors. Once they get on, Janay Palmer — who is now Rice’s wife — keeps her head down and doesn’t say a word, but the New Rochelle native’s intimidation tactics continue. The elevator doors don’t even get a chance to close before Rice jumps in his future wife’s face two more times and follows up with a quick swipe with his left hand, but it doesn’t appear to fully connect. When Palmer appears to stand up to him, Rice throws a pulverizing left punch which drops her head on the elevator hand rail — knocking her out cold. The Pro Bowler looks down at her unconscious body as the elevator stops at a floor. When it finally arrives at their destination, Rice drags her body out of the elevator before cruelly dropping her on her face. Previous footage had shown Rice dragging Palmer’s body out of the elevator, but these are the first shots of the incident. The NFL suspended Rice for Baltimore’s first two games of this season, a decision that has earned Commissioner Roger Goodell much criticism and ultimately led to the league adding harsher domestic violence policies. It was believed Goodell had access to this new footage before his ruling came down, but the NFL said differently on Monday. I won't be embedding the video here for very obvious reasons. If you feel the need to see this, you'll need to find it on your own. I don't believe for one moment that the NFL didn't have this footage when they issued their initial suspension. I mean, come on, it's the freakin' NFL. With all the resources they have at their disposal, I find it hard to believe that they got outworked by TMZ. They obviously knew about this, and didn't care. Rice is a marquee player and the Ravens are a marquee team. They knew better, but really just didn't give a sh*t.
Even if you bought their story that they didn't have the elevator video, what's undeniable is the hallway footage, which they most certainly did have. It's indisputable that Rice cold cocked his wife. Seeing him in the process of cold cocking her doesn't change that. The outcome's the same. He knocked his now-wife unconscious. Period. In any event, the league's now got a fullblown PR disaster on their hands, one that's neatly timed to overshadow the one the NBA is experiencing. Good luck with that, Mr. Goodell. Question: What should the proper suspension be for Ray Rice?!? Did the NFL really have the footage beforehand? 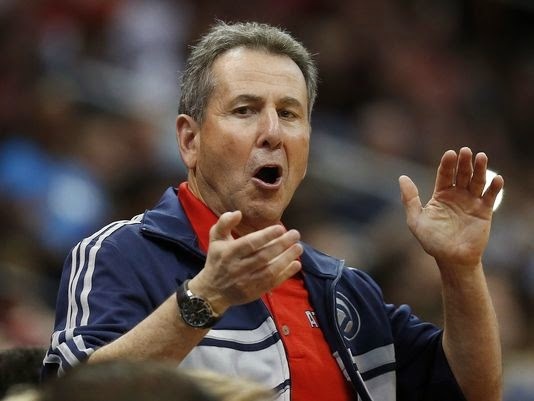 Why Did Bruce Levenson Really Sell The Atlanta Hawks?!? As an avid NBA fan, one fringe benefit of having a job that requires frequent travel is that I get to go to NBA games in other cities. I'd conservatively say I've attended a game in 2/3 of NBA arenas. Some franchises (The Celtics, Knicks, Blazers) have a festive game night atmosphere that's downright amazing. Some others (The Bucks, Pistons, Raptors) are so dead you wonder if you accidentally stumbled into Barnes & Noble. The Atlanta Hawks fell somewhere in the middle the one time I went. Not dead, not certainly no Golden State Warriors. Getting paying fans in the seats is an ongoing problem for virtually every pro sports league except the NFL. The NBA particularly has this issue in markets like DC, Miami (pre-Big 3), and Atlanta where people are generally more transient and bring rooting interests from their hometowns. It's not abnormal to go to a Wizards game and have 75% of the crowd cheering for the opposing team. For the people who own and market such franchises, getting fans to show up and remain engaged is a challenge, especially if the teams aren't going particularly well on the court. Atlanta Hawks co-owner Bruce Levenson apparently had some grand ideas on how to solve this problem, and stated them in an internal memo that somehow became public yesterday. The memo had some very pointed statements about black fans vs white fans, and has some people comparing Levenson to Donald Sterling. Levenson was one of the strongest critics among owners of Donald Sterling, the Clippers owner who was recorded making racist comments and quickly banned for life from the league. Levenson is stepping down, effective immediately. Hawks CEO Steve Koonin, who joined the team in April after leading Turner Entertainment, will take over team operations. I'd encourage everyone to actually read the email before commenting. It's full of a lot of misinformation and expressed an unnecessarily myopic viewpoint on why the Hawks can't draw fans. Personally, while there was plenty of "racial" commentary in the email, I didn't necessarily find it "racist", and I certainly don't understand how it compares to the Donald Sterling situation. Many of Levenson's comments, particularly the ones about black fans not cheering as hard, as observations I've made myself over the years of being a season ticket holder. Some of what he's saying (ie: the issues with the cheerleaders and black fans hanging at the bar) are silly. Others (black fathers not bringing their sons to the games) were spot-on from my personal experience. Eerily absent: any comments about the actual product on the floor. Reality is, black or white, nobody wants to spend good money to see a boring .500 team. Nobody but me, of course. Go Wizards! The oddest thing is the NBA's insistence that Levenson "self reported" and internal email from 2 years ago? Uhhh, sure, okay. Whatever. Anyways, read the email and let me know what you think. Question: Was this really an offense worthy of selling your portion of the team, or did Levenson just take the easy way out? How do you think this actually went down? What did you think about the email? Racist or just racial? Uhhh, so yeah, I got missing for a couple of weeks. Between work, and kids going back to school, and a short vacation for my 13th anniversary (yes, it's been that long) I just didn't have time, folks. Sorry. Things should get back to normal in a few days. Until then, here's a few stories of interest. 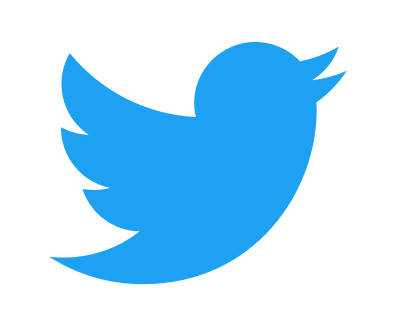 Question: Got any links/stories to share?